How to Butcher a Pig Like a Slovak! In the dark of an early winter’s morning, Deduško (Grandpa) shuffles out into the cold. While the rest of the household is still sleeping, he lights a fire at the bottom of each of the barrels, heating water for the day ahead. Today is zabíjačka, a backyard pig slaughtering. Since spring the family has been raising a pig in a stall in their yard and now it’s time to prepare for the Christmas festivities ahead, full of family needing to be fed. The evening before we prepared for the big day: washing large pots, peeling mounds of garlic and onion, setting up tables and the barrel stoves. These barrel stoves seem like a symbol of a bygone era to me, even though still in use. A door cut into a metal barrel reveals a grate on which a fire can be built, to heat the 50 litre cauldron of water sitting inside. The set-up can be used for cooking large amounts of goulash or, as in this case, for butchering a pig. Butchering an animal (and its description) is not for the squeamish. Having grown up on a farm myself, I enjoy the camaraderie of cooperation, of the family coming together to provide food from their own backyard. I’m grateful for the life of the pig and life it contributes to in providing tasty sustenance. The butcher comes and the boys troop out to the pig sty. An electric shock and cut to the jugular: the pig never knows what hits it. They then collect the blood in a bucket, stirring with an arm as it cools so that it doesn’t coagulate. The water that has been heating up in the cauldrons is steaming and is used to wash the carcass. Wash, scrub, wash, torch, wash, scrub, wash. 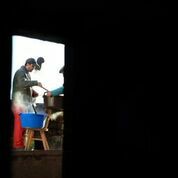 The butcher likes to talk, entertaining with earthy humour as the men work up a sweat. The pig is hung and the butcher starts to clean it out. Random bits of meat, bones, and organs go into the cauldrons. In a Slovak butchering, almost every part of the pig is used – nothing is wasted. My husband says that everything but the toenails and gallbladder get used. Technically this is true, although now the casing for the sausages is from another pig, bought as cleaning out fresh intestines is extremely labour intensive. The dish Babička cooks, then, is Mozgy (brains) – a dish of ground meat, brain, and spinal cord mixed with egg. Mozgy is lunch, every time, paired with bread and homemade pickles. If you can get past the idea of brains in your food, it’s actually quite delicious. The butcher cuts up the meat, his knife deftly finding just the right spot to break apart a joint or the separation between muscles. His muscular forearms defy his late 70 years, and he keeps up the conversation with a surety of opinion and a glint of humour in his eye. Tlačenka, a non-greasy headcheese. Pieces of meat, offal, and herbs are suspended in gelatin hard enough not to jiggle. 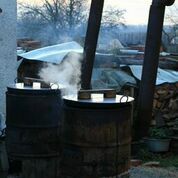 Sometimes tlačenka is put in the stomach of the pig before the animal is sent off to the smoke-house for smoking. Zabijačkova Kaša (A kind of black pudding), a barley porridge cooked smooth with the blood in the bucket. Podbradnik, literally under the chin, is a hunk of fat that has boiled in the cauldrons and then smeared with garlic paste and paprika. Slovaks slice it and eat it on bread, a pure slice of fat (I admit, this is probably my least favourite product of the day). Bacon, lard, baked meat, and liver pate are also made. 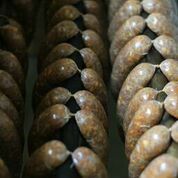 Sometimes they make canned meat or klobasa (a kind of sausage). Then there’s a stock made from the organs and a few bones – it’s used to cook rice and barley, and as a base for the tlačenka. 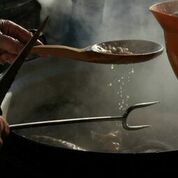 When one cauldron has been emptied and washed, it is used to make lard while the other cauldron is used to make the Zabijačkova Kaša/black pudding. It’s starting to get dark – it’s been a long day. Babička has washed more dishes than humanly possible. 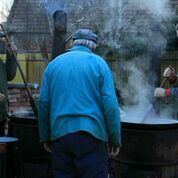 Outside, it’s still going on: brothers take turns stirring the cauldrons of lard and Zabijačkova Kaša – the latter taking about three hours worth of constant stirring. We stand around the fires, keeping warm and keeping conversation in the failing light. I’m starting to get tired and wonder how my elders keep on for so long. The Zabijačkova Kaša doesn’t keep long or freeze well, so it’s ladled into large bowls and small pots and taken around to neighbours, who are glad for a nostalgic taste as fewer people are keeping pigs. When the last dishes and cauldrons are washed, the day is finally done. Meat rests in the cool basement, to be packaged and frozen tomorrow. I’m stuffed to the gills, and while there is baked meat slathered with paprika and onions for supper, I’m ready for a salad.